Hey there. It’s me, Melinda Langston. We haven’t met yet. I’m filling in for my cousin, Caro Lamont. You know, the pet therapist. I talk to my bulldog, Missy, but I’m no animal shrink. I’m more about pampering our furry friends. I own Bow Wow Boutique an upscale pet shop in Laguna Beach. I love the holidays. Especially, Christmas. Not just for the obvious reasons: the uptick in business, spending time with friends, scrumptious food, Christmas music twenty-four hours a day, the crazy light displays—including inflatable lawn ornaments. Shouldn’t everyone have a six foot snowman in their front yard? I also get a kick out of helping my quirky customers find that special item for their four-legged fur baby. Sometimes it’s as simple as a new leather collar, pup perfume, or a fabulous couture outfit. Other times it’s about finding the perfect Swarovski-studded cat flap, a gold-threaded mattress, or a luxurious dog carrier. If you think I’m making it up, check this out: Ridiculously Expensive Pet Products. You’ll notice I didn’t mention family. Not because I’m alone. I’m engaged to a wonderful guy, Grey Donovan, and even though cousin Caro and I aren’t on speaking terms, we will always have each other’s back. I love my family, but... Well, it’s my mama. She’s a complicated woman and our relationship isn’t exactly Dr. Phil approved. She makes me crazy with her drama demands, but I do love her. 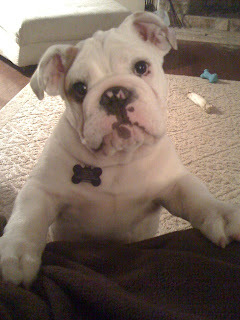 So in a moment of weakness I sort of promised her I’d come home to Dallas for Christmas. When I made that promise, I intended to keep it. That was before Dr. O’Doggle was found dead in front of my boutique. After that going home to Dallas was the last thing on my mind. You can read all about it in Yip/Tuck. What about you? What’s your favorite part of Christmas? As part of Killer Characters’ “Season’s Readings,” we’ll be picking a winner to receive a Pampered Pets Mystery of your choice! Please leave your email address with a comment. Liz - What a wonderful family legacy of passing down a special cookies recipe! Being with family, friends and doing what I can for the less fortunate! Thanks, Candace! 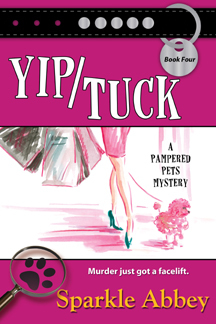 We have a lot of fun with titles - books in the Pampered Pets Mysteries series are (in order of release) Desperate Housedogs, Get Fluffy, Kitty Kitty Bang Bang, and Yip/Tuck. Coming up next is Fifty Shades of Greyhound. Dianne, that is fun! We have neighborhoods in the city that really go all out with the lights and decorations and a few companies that do big displays. Always fun to see how creative folks get with their decorations! Children really do make the season magic, don't they? We agree! Sometimes those newsy newsletters are a great chance to catch up on what's happening with friends and family. How fun! So far this year it looks like it will be a white Christmas. Being with family and watching my grandson open gifts. Absolutely! Being with family and the excitement of the kids and their gifts is the best. We both now have grandchildren which we've discovered adds a whole new level of fun! Agreed. It gets harder to get the family together as everyone grows older, leaves for college or starts their own little families, that when we are able to finally be together, it makes it that much sweeter. Christmas movies/shows - my favourite is the whole family gathering to watch Christmas Vacation, we do it every year. What a great tradition. Christmas Vacation is hilarious. The animated Christmas programs that I remember when I was a kid but they are still enchanting. Santa Claus is Coming to Town is my favorite. Mary, do you remember The Year Without a Santa Claus? I loved Heat Miser and Snow Miser as a kid. Sandy - Ah, yes, the food! The Christmas decorations and lights that make this colder, darker time of year brighter and cozier. Elaine - Our part of downtown has so many twinkle lights up and it's great when you walk out of work (in the dark this time of year) and see all them! My favorite part of Christmas is the quiet times, sitting in the darkened room with all the Christmas lights on, perhaps watching a classic Christmas special. It's magical! Katreader - Do you have a favorite Christmas special? My favorite part of Christmas is being together with my family for the traditional Holiday dinner and all the wonderful food and memories we make and share together! Merry Christmas! Merry Christmas to you and yours, Sharon! It's very much about making memories, isn't it? I love being able to watch Bing Crosby and Danny Kaye in White Christmas. We love the classics too! Can you hear Bing singing right now? "I'm dreaming, of a white Christmas..."
Kaye - Christmas cookies! Yes. Do you have a favorite recipe? Being with family while the house has the aroma of just baked goodies! Kaye - We can just picture it. Or maybe that's we can just smell it. Getting in touch with old friends is my favorite part of the holiday season. Some folks I only hear from once a year and it's such a treat to see what they have been up to. Penny - Thanks for stopping by. You're right it is a treat to get in touch with old friends at the holidays and see what's been going on in their lives. Would it be so wrong to say my favorite part is eating all of the goodies?? Oh, and getting together with family, too. Not wrong at all, Linda! My beagles are definitely pampered pets, too. They would say that my favorite thing about the holidays is watching them play with their new toys. Hi, Sue. Isn't it the truth. And sometimes watching isn't enough, we must play with them. Wow some of those things are truly ridiculously expensive. I do like the special dinner dishes you don't get at any other time of the year the most.